These are essentially the baked tuck-shop crisps that I used to eat in reception class (when they were called Fish n Chips) but remade for the healthier age. They are whole wheat and baked which adds to the flavour and reduces all the bad things, and they come in big cinema size sharing bags. We took them to see the NFT version of Frankenstein (a play as a film) and the Giant Screen version of Metropolis at Millennium point Birmingham. The three flavours are all similar in that the base is identical and all varieties are vegetarian which means that no-one feels left out. The biscuits themselves are indeed llama shaped, but during transit some of these become a bit snapped so you do end up with a load of llama heads at the bottom of the pack. The Sweet Chilli was probably my favourite and these are very mild really, but just exciting enough to be able to keep eating. The BBQ ones are probably the most ordinary of the flavours, but putting them on the baked biscuit still makes it a very compulsive option. I'm not that keen on cheese flavours, but these are more similar to a Wotsit or McVitties Cheddars edible but not my favourite (although the cheese lovers really liked them). I'd certainly buy these again (at the moment they are £1 a bag which is very reasonable) but the dusty nature of the coating means they would be excluded from most games nights and reserved for things like the cinema or a nice picnic. 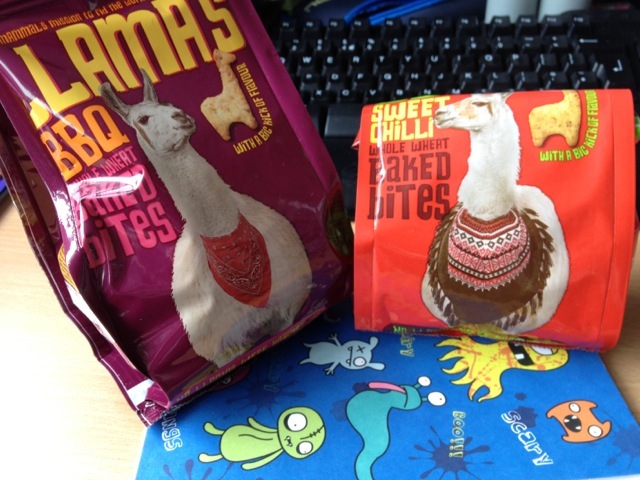 I'd probably eat these if they were not shaped like Llamas, but I probably wouldn't have noticed them to start with then. Silly only really sells the first time, but quality keeps you coming back for more. These Roasted Peanut Puffs were produced by Ellert, in Hertfordshire. Made with farm grown corn and peanuts this crunchy corn snack was blended with sunflower oil, cooked and then coated with ground roasted peanuts. They have the same consistency as cheese balls or puffs, but have a decent flavour of roasted peanuts, rather than cheese. Per 100g serving (but I ate the lot in one go...) they were 500 calories, with 24g of fat and 2.3g of sugar. Suitable for vegetarians and made with no artificial colours, the ingredients included; corn grits, peanut kernels, sunflower oil and tomato. These would go rather well with a few beers and a very long movie, considering the size of the 140g bag. I was dubious at first, thinking these corn snacks would be dry and dull in flavour, but once I’d poured them into a large bowl and started popping them into my watering mouth I quickly realised I just couldn’t stop. Next time I’ll put a longer movie on and grab me a few more cans of beer. Happy munching! Recently I have been discovering Pom-Bear crisps, even though I am a little bit late to the party! They have been releasing a fab selection of new varieties which has really caught my attention. If I am choosing crisps flavours for myself I do have a preference for the meaty ones, I love roast chicken crisps and smoky bacon flavour is up there in my top choices too. Pom-Bear make the cutest of crisps. Each one is in the shape of a teddy bear, and they look so sweet. They have a light crunchy texture, and they dissolve rather easily after a couple of munches. The flavour of these was impressive. It was quite strong, and had the perfect mix of meatiness and salt, which recreated the bacon flavour rather nicely. The aftertaste was a hint of smokiness than just added nicely to the overall combination. I think the other thing that adds to my love of these Pom-Bear crisps is the calorie content. At 98 calories per pack, they are super low for crisps, yet have a good full flavour. There also seems to be loads of the little bears in the bag, so you feel like you are getting a decent serving size too. I have a couple of the multi-packs of these bacon flavour ones, and am very much looking forward to munching my way through them. These are definitely my favourite of the Pom-Bear crisps I have tried, and they are well worth hunting out. Based on the Nestle Curiously Cinnamon which is a nice crispy, but unusual, taste sensation this takes the same formula and just adds strawberry. It's certainly designed to be light hearted and childish, but doesn't have any activities to do on the box. It does have lots of vague health info to make sure that the parents are convinced that they are not giving their kids bowls of sugar every morning, and fuelling a hyperactive day at school. 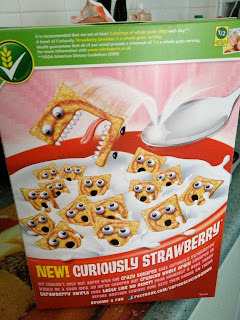 As a cereal experience they hit the spot. They are crunchy and have a great flavour which is just the right side of sweet and fruity and doesn't get too overwhelming by the bottom of the bowl. 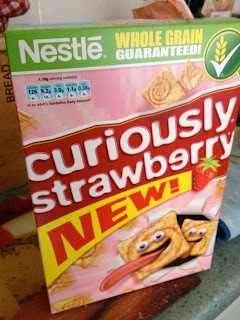 I see them more of a treat cereal than an everyday breakfast and probably would only add a box to the stack in the trolley occasionally. For people who like a light breakfast and want something a little more exciting than their normal fare then this is a good option. This Football Fever Swizzels Mix was produced by Swizzels Matlow. There was two of each sweet type in the mixed bag. Fun Gums were flat penny sized sugared fruit flavoured jelly foam gums. The gums were red one side and white foam the other, with a very tasty and moreish Strawberry flavour. Drumstick Lollies had a vertical split down their centre with one side white and the other pink, and had a succulent raspberry ripple ice cream flavour to them. Double Lollies were a mixture of cherry and orange flavour tasting exactly like the famed Swizzels Matlow’s Double Dip, and I just couldn’t help scoffing these at double speed (sorry!). The new Candy Floss flavoured whistle had a sharp cherry flavour; Cinabar blew the whistle on the train on the way back from a trip to London and gained some funny looks from the other passengers! The last, but not least of the Swizzels Mix was the Fruity Pop boiled sweet lolly. Mine was pineapple flavoured and tasted great, lasting for ages. Cinabar had the blackcurrant Fruity Pop lolly, which she stated had a wonderful blackcurrant zing to it. I really enjoyed sharing these sweets with Cinabar on the train back from our trip to London. They made us feel young, which is extremely important when eating sweets as an adult. These sweets should be enjoyed by anyone at any age, whether supporting your team in the Euro 2012, or just sharing amongst friends. Also available in the Football Fever range are bags of Swizzels Lollies and bags of Drumsticks. A lot of my reviews recently seem to be things I've picked up while out and about. I don't snack that much at home and as people have noticed a good novelty drink is much more my style than a handful of chocolate bars. 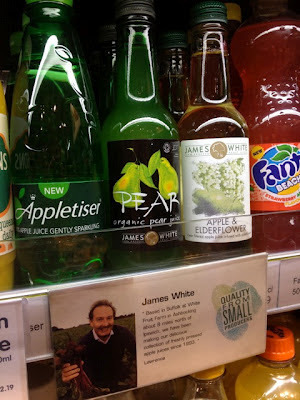 This is less novelty and more farm shop - I spotted this 'small local produce' entry in the newsagents at New Street Station and thought it looked like something out of the Tesco Wine aisle. The bottle itself too is like one of those single glass of wine things that you see nowadays. As I was a bit thirsty and looking for something to start the day nicely I eschewed the typical energy drinks and went for the juice instead. Spectre has also tried something by James White with slight regrets afterwards, but this seemed a safer option than Beet It. 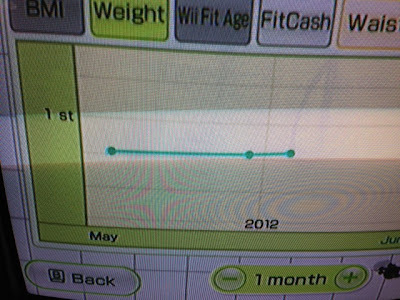 As you can see it didn't last long. 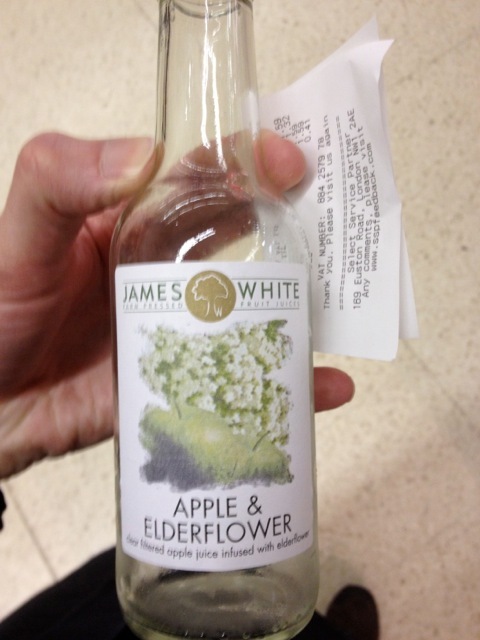 Maybe it was the nice balance of the apples with the hint of the base-notes from what could only be the elderflowers? 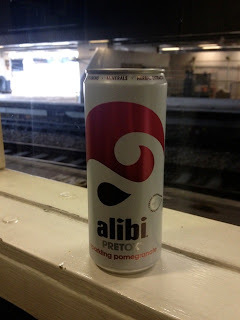 Maybe it was because it looked like I was swanning around the station at 9 in the morning swigging from a mini wine bottle (they have an M&S on the platform that sells these things) that encouraged me to finish it off. It wasn't a massive portion, but it was enjoyable and refreshing and worth a hunt for. I forget the name of the chain of mini newsagents that is at the station now (it's the one that sells fruit and things so looks like a postage stamp sized supermarket) but I've seen them nationally - maybe each have different UK home grown products. Eitherway this James White juice would not be out of place at a farmers market or on the shelves of Waitrose and is a welcome find from the Station platforms. Walkers make crisps, this is what they do. They have some crisps branded as Sensations – which are a bit posher, and have some interesting flavours. Recently though Sensations have also started making flavoured peanuts! I can’t quite imagine how that conversation went down at the marketing department. Anyway, somehow or other the product went ahead, and here we are. There are a few different flavours available, but I thought I’d start by trying the Chinese Szechuan Pepper. Each peanut is coated with a thick wheat/rice coating that is pleasantly crunchy and full of flavour. They have a good texture, crisp, but not too hard that they are difficult to eat! 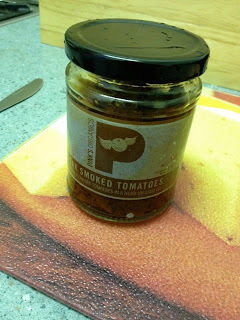 The taste is quite herby, with a good hit of cumin and curry power and a pleasant warmth. They are by no means ultra hot, but the chilli adds a decent tingle. It works well with the rich nut taste from the peanut and makes an incredibly moreish snack. These nuts were far too easy to munch our way through, and the re-sealable sticker on the back of the pack was a little optimistic to say the least. While browsing for reviews in Worcester Y'day I realised that I'd bought three drinks there a good while ago and never got around to trying them. This is because not only did they look odd the lady who owned the store said that non Thai people didn't tend to like them so she made sure whenever people did that they understood what they were trying. This at the time seemed exciting, but not exciting enough to dig them out of the cupboard - until now. 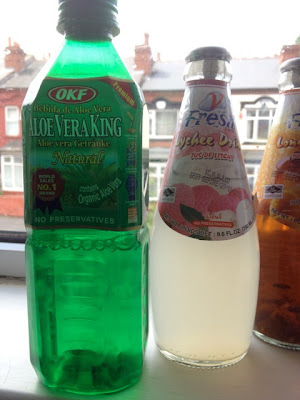 This week to ease myself in I'm going for a new drink I picked up which has bits of Aloe vera floating in it (not too shocking - I like these drinks) and a Lychee drink from the same range as the oddities. Front left we see the Aloe Vera King, which is a Korean brand succulent drink. Those little white bits floating in the drink are shredded Aloe Vera (which is a cactus like plant, and pictured on the bottle). These are smooth tasting refreshing drinks, that function a little like orange juice in that we psychologically think that they are more natural and better for us than they usually are. The ingredients show that it's mostly powdered and reconstituted plant, and contains honey and grapes to add the sweetness. I'm not sure how it compares to the other brands I've tried as it's one of those almost forgettable sensations, but it really is refreshing and easy to drink so something that I routinely purchase. Next up we have the Lychee drink from the range of doom. This is incredibly white for Lychee juice - and yet the ingredients are essentially just lychee juice and water. It's a little thicker than I'm used to, but not that sweet. The flavour is strong and authentic though, and the little red/white fruit taste is certainly nice. This is made in Thailand and certainly has a similar flavour range to a lot of the local food, it has more of a fragrance than a full on fruit juice does, but the taste lingers. While I do like the Rubicon Lychee I think that is more of an everyday drink and this is a little more deluxe. I'm not sure I've seen the V Fresh range outside of Yum Yum's shelves, but I think it’s very likely to show up in other import stores. Eventually I'll be brave enough to try the Longan variety that is just about in picture, and the disturbing looking Green Tea with Basil seed that I was cautioned about. I do like popcorn. It is such a tasty and healthy snack (unless you buy the toffee coated kind)! It is a much underused product, so when I heard that Wild Trail was making popcorn cereal bars, I was really keen to give them a try. I have to say that I was a little disappointed to find that the Fruit and Double Nut bar contained just 6% popcorn, so I couldn’t help thinking that Wild Trail were very much playing it safe. The bar itself was lovely and sweet, and had a fabulous complex mix of textures. The nuts and fruit shone through, but the popcorn flavour was a little bit lost. The yogurt had a slight bitter edge but it was sweetened with honey which balanced it nicely. The cranberry version had lots of sweet berry tastes, and was also thoroughly enjoyable, but was still lacking the popcorn edge. So as far as cereal bars go, the flavours were really good. I loved all the seeds and goodies contained within them, and the taste was impressive. As far as representing a popcorn flavour, it was a little lost within the heaps of other ingredients packed into the bar. Personally I’d favour a higher percentage of popcorn in the bars, to allow the flavour of it to fully shine through as this is what these bars are supposed to be about. The bars do taste good as they are, there is just so much in there it is hard to decipher the popcorn. Cinabar has written about Christmas shaped Animal Biscuits and Spooky Halloween shaped Animal Biscuits in the past. She recently passed me these Jumbo Animal Biscuits and asked me to write a quick review to let all our readers know the good news. Yes, after all these years in miniature, Animal Biscuits just got bigger! 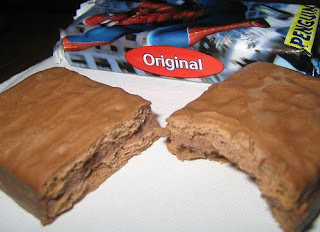 Ever since I can remember anything at all, I have always loved Cadbury’s chocolate Animal Biscuits. I used to eat them at my grandparent’s house when I was a tiny lad visiting on Saturday afternoons. It was here I also found a close bond to Walker’s Ready Salted crisps, later in life finding the shear indulgence of a good pint of draft ale and a packet of Ready Salted on a Saturday afternoon in the pub, whilst reading my favourite Commando comics. Anyway, I digress; there was fifteen Jumbo Animal Biscuits in the 125g packet at 40 calories a biscuit. The biscuits came in a variety of cute shapes such as monkeys, lions and elephants. Allergy advice warned that these biscuits contained wheat, milk, soya and possibly nuts. I don’t know about that, but the animals certainly looked crazy (sorry…)! These Jumbo Animal Biscuits had the same superb chocolate and biscuit flavour of their smaller relatives, and certainly didn’t last long! I have to say a bit thank you to my dad for bringing this bar of Milka back from Germany for me. He knows it’s my favourite chocolate, and so kept an eye out see what was new when he was last visiting. Germany always has a better selection of Milka then we get here in the UK, but its availability in the country is improving. So the bar is somewhere between being chocolate coated popcorn and being a bar of chocolate – and the middle ground is pretty much heaven. I have my fingers and toes crossed that this will get a UK release, or at least become available in the import shops! The above is pretty much what the UK's stores look like this week. Same products, new flag based packaging. Our Queen has been doing her job for 60 years, and shows no signs of wanting to stop - which is pretty impressive as your average person complains that the retirement age should be 60 - and she is 86. This does call for a nice party, but it's hard to combine traditional English values with new product launches so the bunting manufacturers and the box designers have been busier than the R&D people. 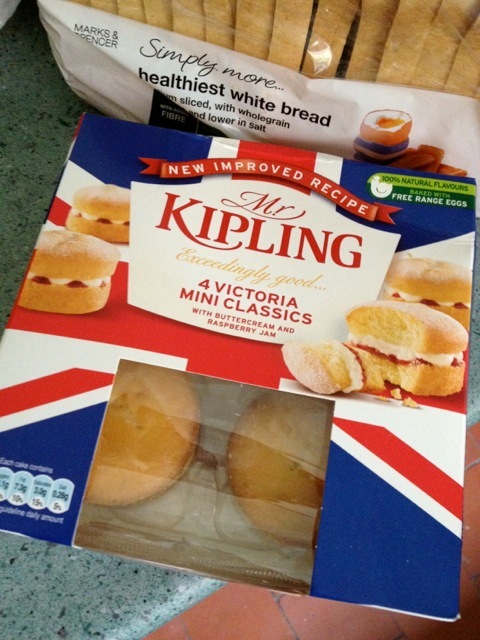 The above were very nice mini Victoria Sponges actually, not perfect as it's not fresh cream, but correctly using Raspberry and not over sugaring the mixture. Good call Mr. Kipling - I'm growing to like the direction you are taking with the new recipes. I had a quick look around to see exactly what products have been floating around since the original coronation that I already wanted to talk about and realised that McVitties Penguin was born in 1932, predating even United Biscuits themselves by 14 years according to the Wikipedia (which was when the inventor of the Penguin and McVitties joined forces). I bought some Penguins a few months back to see if they had changed much since they were the only chocolate bar my Grandparents used to buy for us some 20 years ago. They have not - but I have. 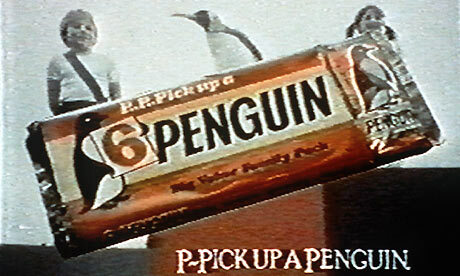 Long gone are the days when I'd P-P-P-Pick up a penguin (the old advert slogans are still the best), and now I drift to Oreos and things with 'new' on the box. 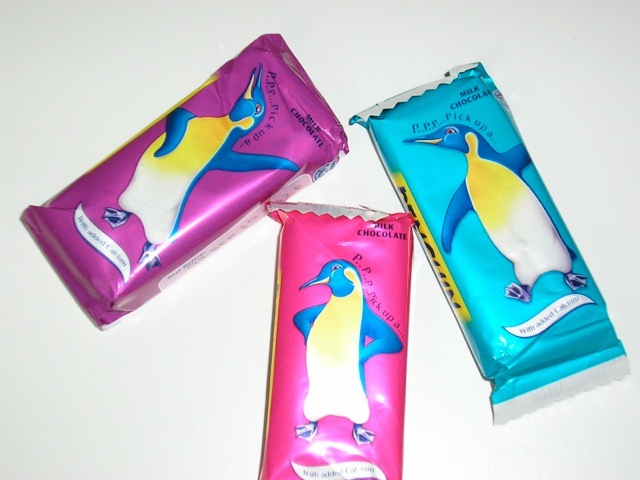 The interesting thing is - a Penguin is essentially a milk-chocolate Oreo covered in more milk-chocolate. Is my love for Oreos just a rekindling of my love for the classic Penguin, but in a darker biscuit? Heck - why haven't McVitties released a upgraded Gentoo Penguin with a higher cocoa content and maybe even dark chocolate? A quick google search reveals nothing similar to this. In Australia they have the Tim-Tam which is essentially a Penguin for warmer climes, and it's possible they have gotten more experimental with that. In the 80 years of Penguin someone must have spotted the link to the Oreo and tried the switch - surely! So a happy Jubilee to all Brits in the UK and beyond, enjoy the new snacks that we keep finding, but don't forget those that have been around for the 60 years that the Queen has. As part of the Insiders free sample site (sign up here) I got some cat food & fed it to my cats for three weeks as instructed. I ran out half way through and had to go buy more so got the more suitable version for Seniors and the Natural Balance version too (it was on offer). 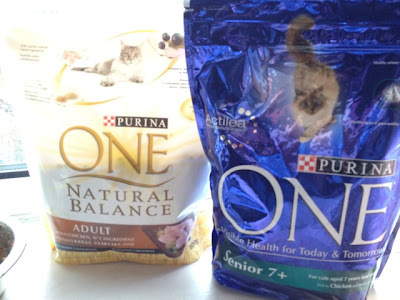 The Purina challenge basically says that after 3 weeks your cats will be improved. 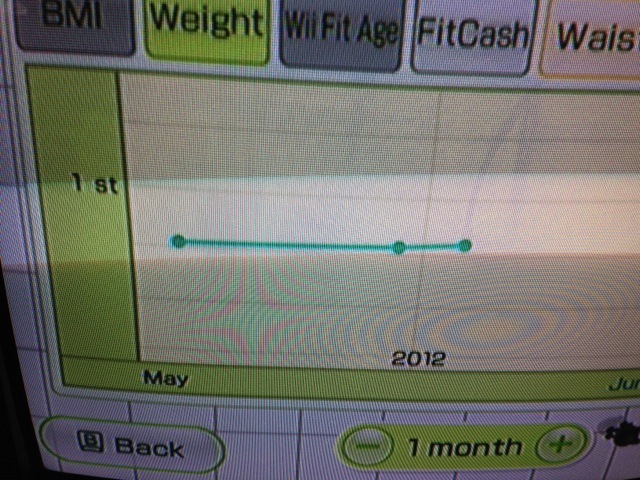 They do seem to be permanently hungry due to the small portions, but according to Wii Fit the two that I could catch at the time have both gained weight! The Kirkby Lonsdale Brewery was founded by four local ale drinkers in 2009. The name of this dark brown, almost black stout came from the Jubilee Field, which is next to Devil’s Bridge (pictured on the front of the bottle), in the Lake District. The field was given to the public to commemorate the Queen’s coronation in 1953, along with a couple of wrought iron gates made by a local blacksmith. Not so long ago my dad went to Germany and bought back a fantastic bar of chocolate called Milka popcorn, and I will be blogging about it shortly. I did google Milka Popcorn, and although my dad bought me back a bar, the images that came back were all of Milka coated popcorn in a bag. I thought the bag of Milka popcorn looked excellent too and wondered if it would be available over here at any point. Shortly after that this Cadbury version appeared on the shelves, they must have read my mind! That aside I decided to just buy the popcorn, and tucked in once I got home. Inside the bag I was impressed buy how big the chunks of popcorn were, each with a healthy helping of Cadbury milk chocolate making them quite chunky looking. The popcorn within them is also toffee coated making them lovely and extra sweet. The popcorn is rather light and has a gentle crispy crunch. The chocolate is milky and sweet and the whole combination works wonderfully. I loved the mix of textures, and the sweet tastes, they are seriously moreish though. This is the ultimate film watching snack, but I warn you, you won’t want to share!